This is a cultivar of Citrus sinensis (L.) Osbeck. For details of the Sweet Orange see Citrus sinensis ‘Chinese Oval’. The following description is of a blood orange still grown in Western Australia in the early 20th century. ‘Maltese Blood. The pulp is streaked and mottled with red. It has few seeds. Tree thornless and of dwarf habit, and may be planted closer than freer growing kinds; hardier than the Washington Navel, and the tree a more generous bearer. The foliage is dark and glossy. Fruit small to medium, oval, of high flavour; a good keeper and carrier.’ [Despeissis p.237/1903]. The Blood Orange is a variety of some antiquity, probably originating in the Mediterranean region some centuries ago. I have no specific information on its origin. 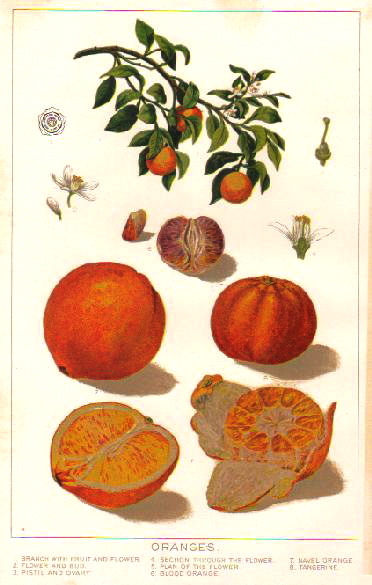 Listed in the 1845, 1850 and 1857 catalogues as ‘Malta or True Blood Orange’ [Orange Tribe no.12/1845]. Citrus sinensis ‘Blood Orange’ | source unknown. The blood Orange is the small red orange in the centre.